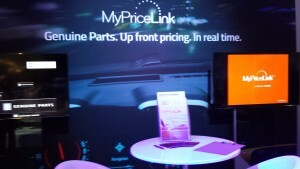 Though a couple of dealer management systems required minor fixes, the first week of MyPriceLink has so far been happily uneventful, a General Motors executive said Thursday. “We had a couple minor things,” GM wholesale dealer, customer care and aftersales manager John Eck said following a GM meeting on the dynamic list pricing system. Both were particular to certain DMS versions, and both issues were quickly ironed out, he said. MyPriceLink, which launched Tuesday, automatically updates GM list prices in AudaExplore, CCC (CCC ONE and Comp-Est), Mitchell and Web-Est estimating systems. Collision repairers use the IPs as they always have and see the new prices in the same places the pre-MyPriceLink list prices were — you basically won’t notice a difference if the system performs as planned. From the shop end and overall system end, things worked as intended, according to Eck. “This morning’s metrics are extremely strong,” Eck said. The amount of users receiving real-time GM list prices through their estimating services wasn’t creating serious lags or crashes, he said. Though MyPriceLink allows GM to change list prices whenever it desires, the company isn’t doing so while it watches the fledgling program’s early performance post-launch. Eck wouldn’t comment on when such fluctuations would begin.